Workplace"Workplace" describes the Autotask Workplace service in its entirety. offers a file locking mechanism to avoid overwriting changes when multiple users access the same file simultaneously. 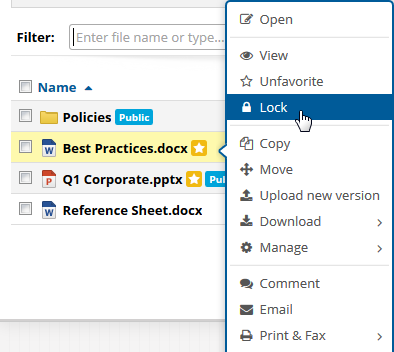 A file can be locked manually at any point, or will become locked automatically when starting to edit a Microsoft Word, Excel or PowerPoint file. If you forget to lock the file, or are unable to lock the file (for instance, you do not have an Internet connection), and someone else edits the document simultaneously, then the first person to save the document will create a new version of the master document. The other user(s) that were simultaneously editing will have their saved versions appended with their names. This mechanism ensures data will never be lost, however you may need to merge two or more documents if users forget to lock the files or be offline while editing. Manual file locking requires that Workplace Desktop is installed. Right-click any file within the Workplace folder. Select Lock for Me. In Windows, you may select Lock and Open. Log in to Workplace OnlineWorkplace Online is the web portal that users within a team can use to access their data and administer their team..
Go to Projects or to your DashboardThe dashboard is an integrated, intelligent overview of all your recent project activities in Autotask Workplace..
Navigate to the file you want to lock. View the file within Workplace MobileWorkplace Mobile is the Workplace application designed specifically for the various mobile platforms, providing access to Autotask Workplace..